Mars Reconnaissance Orbiter (MRO) reached the red planet on 10 March 2006. During its tenth close approach to Mars—its 10th periapsis—the MRO spacecraft turned its cameras to view the planet's surface. Although the images acquired were over a factor of 10 lower in resolution than will ultimately be obtained when the spacecraft and its payload are in their final orbit, these test images provide important confirmation of the performance of the cameras and the spacecraft. Note that, because these are initial, test images, there is some linear striping in the images—this results from incomplete removal of pixel to pixel variations in the CTX detector by the present calibration software. The first picture (CTX-5a) shows a color view cropped from a Mars Global Surveyor (MGS) Mars Orbiter Camera (MOC) daily global map acquired on the same day as the MRO observations. The MOC map shows the planet as if every part could be imaged at some time between 1 and 3 PM, that is, with early afternoon illumination. MRO, conversely, imaged the planet during the morning hours. The MOC view was obtained about 4 hours later in the day than the MRO data. Inserted into the MOC daily global map are the two grayscale CTX views. This shows that CTX first began imaging when it was over the southernmost portion of the chaotic terrain at the east end of the Valles Marineris. A second image was acquired several minutes later, as MRO orbited southward towards the west side of the large Argyre impact basin. The top of each of the two CTX images were obtained about 13 minutes apart. The second figure (CTX-5b) is a comparison of a MGS MOC full resolution red wide angle (WA) image (left) and the first CTX image (right). The MOC image was taken about 6.2 hours after the CTX image, at a local solar time of 13:42; the CTX image was taken at roughly 07:32 local time. The third figure (CTX-5c) shows the full resolution view of the first CTX image ever acquired of Mars. The image has a scale of about 87 meters (285 feet) per pixel, which is 14.5 times lower resolution than will be acquired when MRO is in its final mapping orbit. In other words, typical CTX images acquired during the primary science phase of the mission will have a resolution of 6 meters (~20 feet) per pixel, and will cover an area ~30 km (~18.6 miles) wide. The second image obtained by CTX (CTX-5d) was much longer than the first: 260 kilometers (~162 miles) at its widest point and about 122 kilometers (~76 miles) at its narrowest, some 1,590 kilometers (~988 miles) to the south. It covers an area of about 40,000 km2; the change in width reflects the change in altitude of the MRO spacecraft as it descended towards periapsis (the closest point to the planet on each orbit) over the south polar region. Because it is large, the picture is shown here at one-third its original size. The final picture (CTX-5e) contains the northernmost portion of the second CTX image, reproduced at one-half its original scale (because of its large file size). The white box outlines the location of the first HiRISE image released to the public late last month. The CTX and HiRISE images were acquired simultaneously. 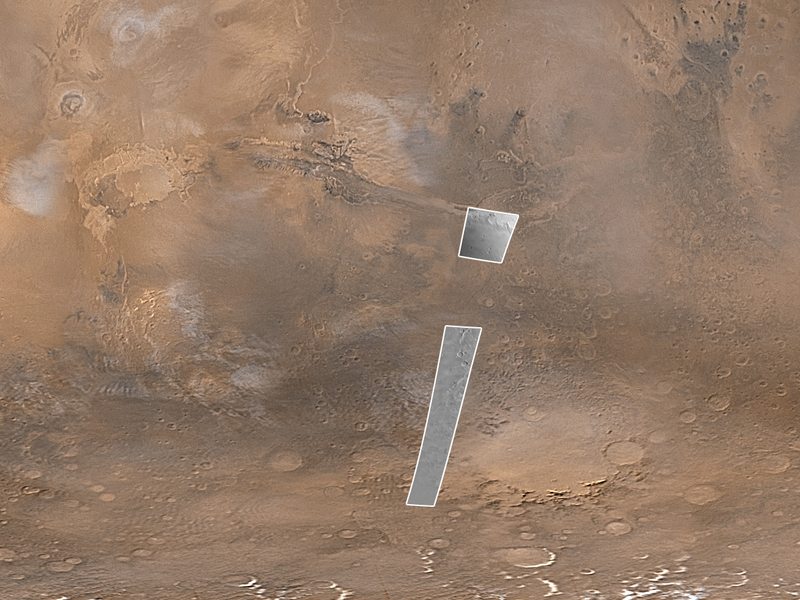 As with the CTX, the first HiRISE image was of a much lower resolution than will be obtained during the primary science phase of the MRO mission, owing to the higher altitude during this test. This figure illustrates one of the key roles that CTX will play during the MRO mission—acquiring context images for the other science instruments aboard MRO. Malin Space Science Systems built the Mars Reconnaissance Orbiter (MRO) Context Camera (CTX) and operates the camera from its facilities in San Diego, California. The Jet Propulsion Laboratory operates the MRO spacecraft with its industrial partner, Lockheed Martin Space Systems Company, from facilities in Pasadena, California, and Denver, Colorado.